Category Archives: nothing about us without us. nothing about us without us. I’ve written a lot here about the hurtful invisibility and casual dehumanization that often happens to the disabled within church cultures; we often become elevated examples of otherness, alternatively lauded as inspirations or projects to “fix” when not being ignored because to do otherwise would require all of us to face our differences, fragility, mortality and how far we really need to go to make radical inclusion a reality. I’m cautiously optimistic today about Anglican forward motion on this inclusion, however. Last week, at the 79th General Convention of the Episcopal Church, a resolution was presented and passed that will create a task force dedicated to accessibility and inclusion; my friend Charis was instrumental in the hard work, advocacy, and visibility necessary to make this happen, and I’m doing backflips of joy (metaphorically), I’m so proud of her. Today, as part of a conference at Lambeth Palace, the Archbishop of Canterbury introduced More Than Welcome, an initiative presented in partnership with UK-based advocacy group Livability, dedicated to creating resources and altering perceptions in order for churches to be more welcome and inclusive to those of us with disabilities. And this is such a needed and transformative step; with that said, it’s a step in a sequence, and so much more is needed for the promise of dignity and belonging t0 be offered to those with disabilities in all church settings. 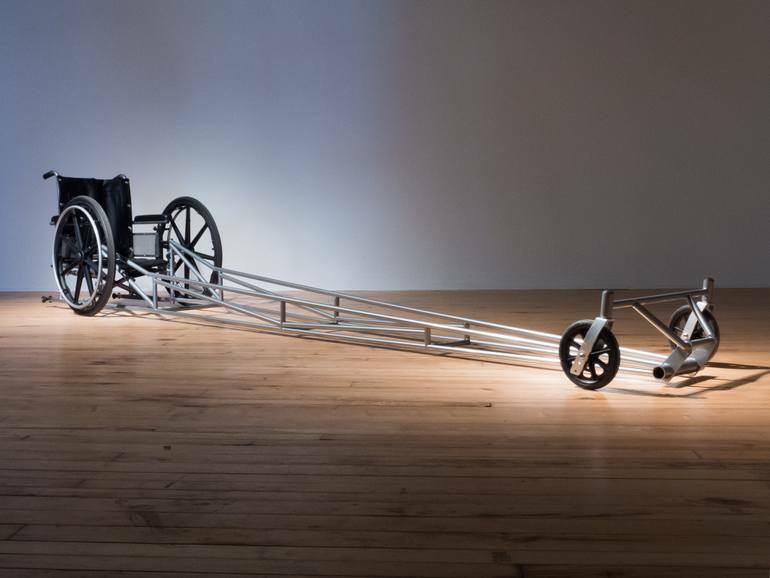 When I first found myself in a wheelchair, people I’d known for decades started leaning over to talk to me, and shouting while they did so; it was bizarre, but so many of my friends who also use wheelchairs laughed and made note of the same thing. As soon as it’s pointed out, people stop this behavior, or actively try to correct it. Being able to have that conversation, and keep it going without shame as a continuum of dignity is created, is so necessary, and so often much more fragile than it needs to be. Earlier this year, I found myself in a roundtable cultural discussion about accessibility in the arts. An executive director of a prominent arts organization lauded a symphony’s single-instance offering of a program for deaf and hard of hearing patrons, in which they could feel vibrations on special equipment as a symphony played a specially-designed piece. I got stuck in this, and in its single-service nature, and how it was presented as such a win: I kept thinking, “Is this really accessibility?” It was certainly an invitation, and it required a whole lot of work, but it felt like a novelty, a different experience to provide SOMETHING that wasn’t quite the art form in a new and accessible state, and the joy and satisfaction at its creation felt awfully like checking a box. At no point will we rejoice conclusively: “WE SOLVED DISABILITY ACCESS! YAY!” We don’t work that way. The challenge doesn’t work that way. Everything is a step, but the journey doesn’t end. We stay on the process and keep evolving as the needs do. And drawing this back to church: it’s my hope from this Anglican initiative, from the conversation within the Episcopal Church, that the value of being seen and heard and rising to the challenge is the most important part of this process; slapping down a ramp or installing an elevator or making sure audio description and open capturing are precise and useful are immensely helpful, but they’re so often treated as conclusive actions, when true access is conversational and adaptive. As the saying goes: nothing about us without us. And there’s no such thing as checking a box that will end this process and end the challenge. See us, hear us, actively participate in and enjoy the dialogue with us. We want to be here and we want to be in communion with you, and there’s such joy and growth to be found in that, on all sides. A friend described the single-instance actions of diversity as inviting someone to a party; true inclusiveness is inviting someone at that party to dance. I like that; It’s high time we all had a shot at showing off some sick moves, right? I’m writing this while receiving a whole bunch of information on the first half of the 79th General Convention of the Episcopal Church, held last week and this week in Austin, TX. Perhaps there will be more on that later. Right now, I’m mildly incensed at how inaccessible much of the itinerary is; I’ve received more than a dozen reports of people in wheelchairs or walkers unable to get to locations of witness, into restaurants, to external events, and more. Visibility of disabled persons seems to be at a marked low; there are marginalized communities in our church that are raised up for witness and homilies thus far, on hotbed issues of gender, sexuality, race, immigration, sexual abuse, and more. But we’re largely invisible. And so I watch from a distance and lament our absence, in image if not in actuality. It’s about being seen. about navigating the world before us, about independence and control of our place in all this, as real or illusory as that may be. And so, here’s my place in that story. Two weeks ago, I received my second generation prosthetic; much more flexible, quieter, lighter, and higher-tech. I wanted it to be beautiful. My first left leg had been named Daniel Day Lewis, as it was My Left Foot. This one was an art project; it’s a bright lacquered blue, and looks beautiful. It will eventually let me move like I used to, down to the patented Elliott Dance of Caucasia (it’s a thing). It’ll bring goofiness back to my physicality. And with that, I named the new leg Agadore Spartacus, after Hank Azaria’s faithful house-man in The Birdcage. I thought a lot about my new leg, and intention, and how this was a full-bodied attempt to reclaim agency over myself. I wanted more expression with it to reclaim yet more of that agency. And so I hand-drew a tattoo for it: a bird leaving a cage, with MORE LIFE inscribed beneath. And so it was fabricated with that tampographed on it, permanently. It wasn’t enough for me. Five years ago, my friend Jamie passed away after his third go-round with cancer. We weren’t always friends; in college, we wanted to strangle one another on the regular. But sometime around 2009 we buried the hatchet and started swapping ideas. We became weird internet friends. And we got seriously sick at around the same time. Being a writer and an information hoarder is useful and dangerous in moments like this, as I spelunk back to our last written conversations, before a brain tumor took his life. I think a certain amount of denial is healthy. Obviously not total denial, but I can say from experience that the worst thing you can do is let it consume you. And, then the next day I’d be mad that the stuff from the day before passed by me, but it was my own fault because I couldn’t get my head right in the first place. I’m not implying that’s what you’re doing. I’m just saying that’s totally what I did wrong. That, and pushing people away, especially romantic relationships. I don’t know what your situation is with that, but I know a lot of the time because I saw myself as “scarred” or something I pushed girls away because I thought they would see me as some sick person if they really got to know me, even after I was completely better. Everyone gets sick. Some people just not to the extent of others, and most people are far more understanding then we give them credit for. It’s hard for parents to watch their children get sick, to almost die. And, my father, like when I’m well he doesn’t let me get away with anything, I mean a real hardass. But, when I was sick, the sky was the limit. I’m beginning to think growing up is just realizing how little you knew the last time you checked. And, in another year you’ll probably realize that right now when you think you sort of have a handle on it all, in fact, you don’t. But, that’s okay. I think that’s the process for everyone, everyone who takes the time to think about it at all that is. Anyway, I’m glad that you’re doing well. It’s not an easy struggle. And, ultimately, there really aren’t any words of wisdom that can ease the experience. Though, don’t blame people when they try. That’s just human nature. But, I do genuinely believe now they every day above ground is a good day…just try missing one. I marvel at this; It’s Jamie’s responsibility that I haven’t ended my life, four years and change after he left this planet. I miss him in ways that surprise me. 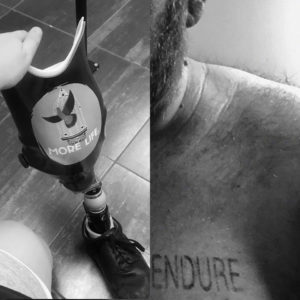 He had the word ENDURE tattooed over his heart. And now, after last week, I do, too. More life. More art. More art used to connect ourselves to life, to express and exert influence over these beautifully built, traumatically altered bodies we are given.